Meet the Druid: Nine Traits of a Druid Part 2 | Spell Hub. Brining the occult to life. Today we’ll go over the final three traits of a druid. 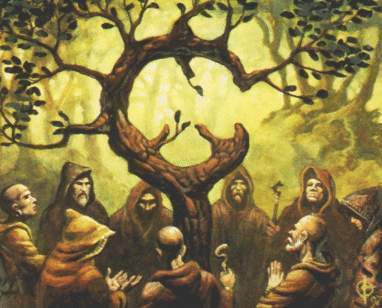 These three traits are essentially what makes the druid iconic to popularized perception. Druids look normal. What good is it to go about your business if you draw attention to yourself everywhere you go and with every action? People have spent centuries confused about what druids actually do because druids don’t make a public spectacle of themselves. They fit in to remain invisible to others. If people leave you alone because you appear “normal” then there is less explaining to do for others and more time to pursue your study and discovery. Trying to “look” like a druid takes too much energy and takes away from what being a druid is all about. Druids treasure knowledge. Classically druids were holders of knowledge and wisdom. They memorized what they learned and could pass it down orally. They studied day in and day out. They traveled so they could learn new things. If there was knowledge to glean, you can bet druids were there to collect it. Their conclusions and theories weren’t based on pure intuitive intelligence, they were based on years of study and research. Today, druids strive to learn as much as they can to understand the world around them. Druids connect. This is the main key. A druid doesn’t just connect with nature by sitting there and watching grass grow. A druid tunes in to other realms. The whole idea of learning druidry is to learn to resonate with the vibrations of our universe and connect with those vibrations on every level they appear on. Whether they’re really into recycling to help the earth or they’re performing a deep ritual that will potentially change their entire life, a druid is “in the zone” through their connection with what they’re doing. Living in a way that deepens our respect for nature and encourages us to connect with the energy around us doesn’t seem like much of a big step if you already follow a similar path. Think of following the path of the druid as an addition to your life. Everyone can benefit from approaching life with levity, laughter, learning and deep connections.